Just a reminder, I call myself the Cancer Curmudgeon, and I mean it. My posts will most often be sarcastic; grumpy even while humorous. I am working on a few less than happy, peppy, perky posts. I believe that the only way to eliminate the darkness, the negatives, the unhappy facts of life is by facing them and dragging them into the light. If you are easily offended, do not read them; I’ll try to remember to tag appropriately. Oh, and there is one mostly positive one coming too. But if you are reading posts by someone who calls herself a Curmudgeon, well, be prepared. What you see is usually what you’ll get. 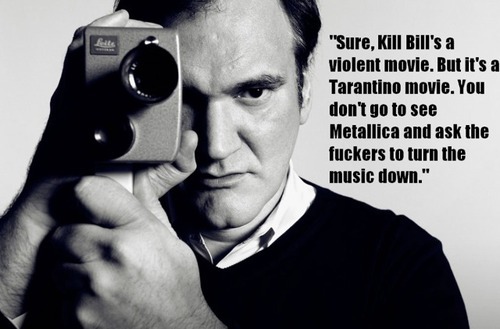 Anyway, this quote from the great Quentin Tarantino applies here. For myself, disclaimers not necessary, but thankfully, your audience is more than just me – curmudgeON darlin’! Aww thanks! Just thought I’ve been rant-y recently, and it will just increase, thought a head’s up might be a good thing. Aww thanks…just you know, warning and reminding. I happen to enjoy and appreciate sarcasm. That’s one reason I love your blog, – curmudgeon-ness (probably not a word, but… ) and all. So don’t hold back! I won’t hold back! Yikes. Welcome to my blog! I do this because I just figure other people must be thinking the same things and facing the bad stuff together is helpful.